New Ruggedized Case Silicon Rubber Bumper and modernized key pad. Note: Silicon case color may vary from the red shown in the images. Thesoftware and features are the same as the original and very popular TCM-U2 ( black case seen in videos ) only the case and keyboard are different. 1 year warranty on probe and tester. Considered to be the Universal type for most general applications. 11lbs of downward hand pressure is required to activate the probe. Surface finish equivalent to 80 grit or better. Induction or carburized machined parts, e.g... camshafts, turbines, weld inspection, HAZ. Load is easy to apply; provides control to test on a sharp radius. Only 2.2lbs of downward hand pressure is required to activate the probe. Surface finish equivalent to 150 grit or better. metals with different properties from steel (for example, non-ferrous metals, alloys, etc.) with five additional scales for calibration; The device can be quickly and easily calibrated to a single specimen of known hardness ( for plus/minus testing ) or to a range of hardness from 2 specimens of the same material and of known upper and lower hardness values. The best is 3 sample specimens of the same material of different hardness. With 3 it is then possible to test through the whole range of hardness values of a material type. The unit has user calibration fields for Steel, Alloy Steel, Stainless steel and 2 user fields. Each in Rockwell C, Brinell, Vickers, plus 2 custom fields for other scales. The tester is supplied with the UCI probe/s pre configured for Steel, using NIST traceable test blocks to HRC and HB. The tester can be finely calibrated to an exact material type e.g.. P20 or H13 but for most users the general calibration, in this case Alloy Steel is generally accepted. Because the tester can be calibrated to specific materials, that range of material classes and options is enormous and huge advantage of testers that have fixed material types. 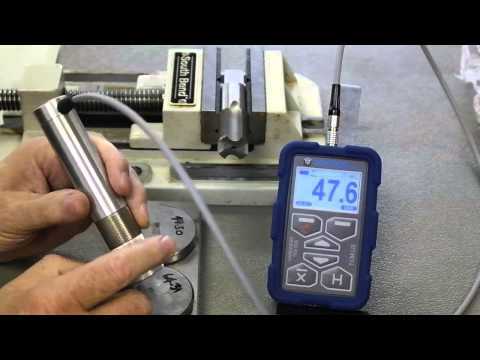 Commonly used to check the HAZ of welds on pipe and other fitments. Implements the method of ultrasonic contact impedance (UCI). 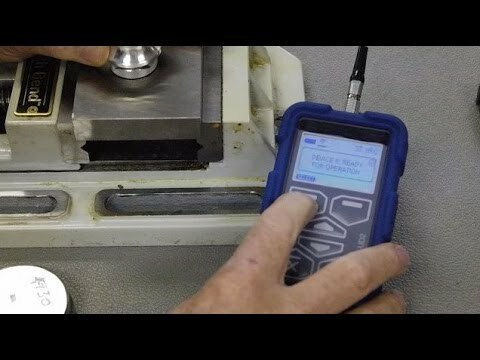 Examples of parts that are most suited to this type of portable testing and cannot be done at all or as easily by other portable test methods are. Other big metal parts like crankshafts, rotors, gears, bearings etc. are easier to test with this type of tool due to the thinner contact area. Materials Steel pre configured. 20 Calibration Scales of Hardness. Divided into 4 Scales and 5 materials for each. Data display Load applied/contact, Single test result, Average of tests, Number of tests, deviation. Hardness indication Backlit LCD display. Battery life Approx. 20 hours. Auto Power off. The values below are pre configured for the optional D type (Leeb/Rebound) type probe. The user can also create/customize their own materials and hardness values. Not specifically suited for measuring the hardness of products with a coarse-grained structure (e.g, cast iron), unheatreated aluminum, or other soft non ferrous materials or parts weighing less than 10 grams (0.35oz), or less than 1 mm (0.04") thick. Just how fast and accurate is a CIMETRIX TCM-U2A ultrasonic hardness tester? This short video shows you.